Hi all, this is Lizzy from Handmade by Lizzy and I hope you’re all enjoying the crisp and cool fall weather! The theme of this month is cozy, and to stay cozy and stylish this fall I made myself the Novelista Shirt (aff link) by Blank Slate Patterns. My go-to outfit when I’m not wearing bright floral sundresses is jeans and a button up. It instantly makes you look put-together without having to put too much thought into it. 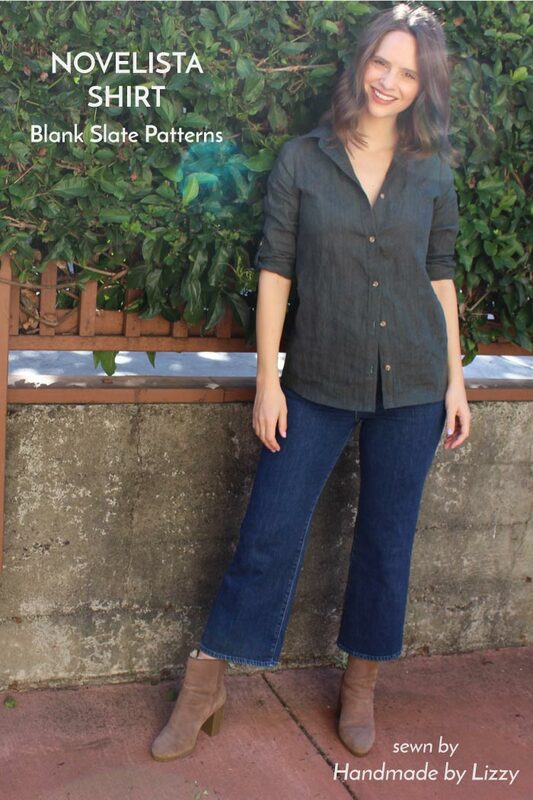 The pattern itself is classic with all the details you would recognize in some of your ready-to-wear button-ups, such as sleek seaming (hard to tell in my chosen fabric) button tabs, front pockets, and yoke with pleat, alongside excellent illustrations and instructions to help you master the tricky bits of collars and cuffs! 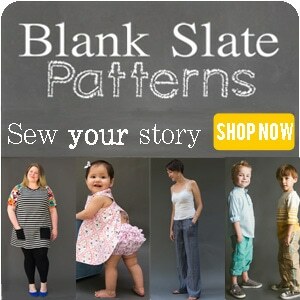 For my version, I made a size small and added 2 inches of length as I normally do since I’m 5’9”. I made my shirt out of a dark forest green cotton/linen chambray with small tortoise-shell buttons. I opted out of the front pockets just because I wanted a sleeker button up that could be dressed up as well. 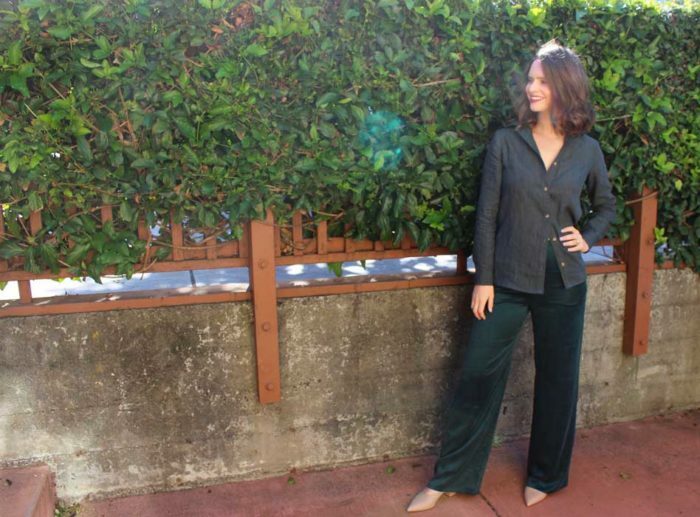 I wanted to show two different ways to wear the shirt to demonstrate just how versatile of a pattern/garment it is! With a sleek pant, red lip, statement earrings and mules I was able to make it into a look fit for the upcoming holidays! I’ll be grabbing for my new shirt all throughout the year, dressed up or down, worn solo or layered, tied at the high waist…Maybe I’ll even make another one lengthened into a dress. 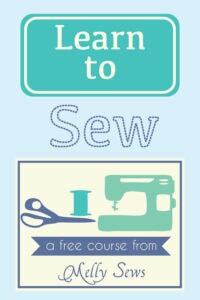 I can feel my sewjo really starting to rev up and I hope yours is too! Happy Fall! Great blouse, really cute and versatile!